Katsi Cook, photo taken by Millie Knap, Katsi Cook papers, Sophia Smith Collection, Smith College, Northampton, Mass. Gloria Steinem. Loretta Ross. Ginny Apuzzo. Katsi Cook. What motivated these women to want to change the world? Beginning next spring, scholars, activists and others interested in the psychology of women’s activism will be able to study the topic in a free online course offered by Smith through edX, the nonprofit online learning organization founded in 2012 by Harvard and MIT. To be taught by Lauren Duncan, professor of psychology at Smith, as an online “treatment” of an upper-level seminar that she’s taught at Smith for 17 years, Smith’s first massive open online course (or MOOC) will launch in March 2016 and run for seven weeks through the end of April. The course is free to anyone who’s interested; to learn more, or to enroll, go to http://bit.ly/1imBjup. Kathleen McCartney, president of Smith, said she is proud of Smith’s new partnership with edX. Smith’s edX course is based on the college’s distinctive strengths. Focused on nine leading activists—Steinem, Ross, Apuzzo and Cook, as well as Byllye Avery, Joan Biren, Luz Alvarez Martinez, Nkenge Touré and Carmen Vazquez—the course will make extensive use of the Voices of Feminism collection in Smith’s extraordinary Sophia Smith Collection of women’s history, the oldest and one of the largest such collections in the world. Faith Khumalo ’15 (right) interviewing activist Nkenge Touré, co-founder of the International Council of African Women. 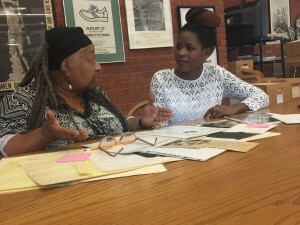 Through courses and independent study, eight Smith students and two Mount Holyoke College students have been collaborating with Smith staff over the past year to develop timelines of each activist’s life and apply various theories of psychology to understand what motivated these women to become politically active. Smith students will also serve as teaching assistants in the course, moderating peer discussions. Anant Agarwal, edX CEO and professor at MIT, noted that Smith’s course is unique in the way that it incorporates content created by students.